Dell Precision M6600. Graphics Card : NVIDIA Quadro 3000M. Network : Internal. WiFi : Yes. AC Adapter : Included. Quality : Grade 2 (below) Scratched / dented lid. Minor marked surround. Battery : Minimum 1 hour standby. Storage Drive: 512GB SSD. Applicable to exports from the UK to another EU country. We dispatch worldwide. Excellent Prices. High quality products at amazing prices. UK QWERTY Keyboard layout. Open Office (Word Processing, Spreadsheets, Presentations, Databases). Dell Precision M6500. Graphics Card : AMD Radeon HD 5800. Hard Drive : 500GB SATA. WiFi : Yes. AC Adapter : Included. Quality : Grade 2 (See below) Minor scratched / dented lid. Battery : Minimum 30 minutes standby. WHAT'S INCLUDED: - Workstation ONLY. SHELF CODE: N27 16/4 30 GH & R40 17/4 9 GH. WHAT'SNOT INCLUDED: - Hard Drives / Standard kettle power lead / Other accessories / Cables / Software / Installation advice etc. Dell Precision 15 5530 (M5530). Dedicated NVIDIA Quadro P2000 4GB GDDR5 Graphic Card. Dedicated NVIDIA Quadro P2000 4GB GDDR5. 15.6" UltraSharp FHD (1920x1080)IGZO4,AntiGlare,w/Prem Panel Guar, 72% colour gamut. Fully working systemboard in bottom case. No Lid or screen. No Palmrest. No optical drive. Windows 7 Pro 64bit installed no drivers installed. Dell Precision T3610 Tower. Dell Precision Windows 10 Tower. Windows 10 Pro. 100% Genuine. nVidia Quadro K2000. Dell Precision T1700 Workstation PC. Hard Drive: 1TB HDD. Optical Disk Drive: DVD-RW OS: Windows 10 Pro 64-Bit. Adobe Reader- Good For Viewing, Printing, Signing, and Annotating PDFs. Skype- Good for Video Calls and Chat. Dell Precision T3610 Tower. Dell Precision Windows 10 Tower. Windows 10 Pro. 100% Genuine. - Display port x4. - Adobe Reader. Dell Precision T1700 desktop PC. SSD - 120GB (New). RAM - 16GB (DDR3). OS - Windows 10 Pro (64Bit). CD/DVD Drive - Yes. Display Port - Yes x 2. Serial - Yes. Headphone - Yes. DELL PRECISION T5810. model Precision T5810. Windows 10 Installed. Windows installed Windows 10. Cable /lead NONE. pci slots 1. Display port 2. serial port 1. WHAT'S INCLUDED: - Workstation ONLY. SHELF CODE: N42 17/4 11 GH. WHAT'SNOT INCLUDED: - Plastic front panel / Hard Drives / Standard kettle power lead / Other accessories / Cables / Software / Installation advice etc. NVIDIA Quadro K2100M w/2GB GDD R5. 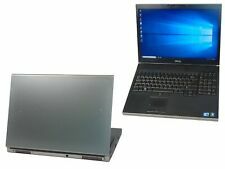 Dell Precision M4800 CTO Base. 16GB 1600MHz DDR3L (2x8GB), MP WS. Dell Wireless 1550 2X2 802.11a c Bluetooth 4.0. WHAT'S INCLUDED: - PC ONLY. SHELF CODE: N17 23/4 9 GH. WHAT'SNOT INCLUDED: - Standard kettle power lead / Other accessories / Cables / Software / Installation advice etc. SPECIFICATION: - See title/images for specification. Dell Precision M4500. Graphics Card : NVIDIA Quadro FX 1880. Hard Drive : 320GB SATA. WiFi : Yes. AC Adapter : Included. Quality : Grade 2 (See below) Heavily scratched lid. Battery : Minimum 1 hour standby. Unit sold as seen. Power cable included. Your right to cancel. 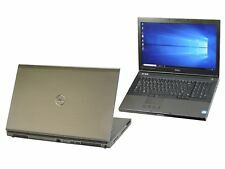 We are offering a Dell Precision M4800 Laptop. This is a used laptop in good condition, with hardly any signs of use. Please check the pictures. We would consider this to be A grade laptop Includes laptop charger and a tested working battery. There is a clean install of Windows 10 Pro. Fully updated, including BIOS. 1 Year warranty. Offered here at £365 Delivered Specs Intel QUAD Core i7 2.8GHz 4810MQ CPU 15.6" Widescreen - Resolution 1920 x 1080 Full HD NVIDIA Quadro K1100M 1GB Dedicated Graphics Card 16GB DDR3 Memory 256GB SSD DVDRW 4 x USB 3.0 / 1 x USB 2.0 HDMI / Display Port E-SATA Bluetooth Webcam WiFi ​​​​​​​ Audio in / out Windows 10 Pro. Hard Drive 320 GB HDD. Windows 7 Pro 64b. Other Webcam. ATI FirePro M7820. USB USB 2.0, 3.0. Wireless Yes. Dell Precision M4800 i7 @2.8Ghz 32Gb 256Gb SSD Nvidia Quadro "High Resolution"
Dell Precision M4800 15.6" Laptop I7-4900MQ Quad Core 2.80Ghz 32Gb RAM. 256Gb Micro SSD. Storage (HDD): 256Gb micro SSD. Nvidia Quadro K1100M with very high resolution Screen 3200x1800 (not a standard screen). Dell Precision T7500 -Intel Xeon X5650 2.66GHz -6 cores, 12GB RAM, win7 64 Bit. Scratches like any other used item but it is in good condition. These are ex-corporate and are sold fully working. This is a low cost 6-core workstation of its kind so far..
4 out of 5 stars - Dell Precision T7500 -Intel Xeon X5650 2.66GHz -6 cores, 12GB RAM, win7 64 Bit. 1 product rating1 product ratings - Dell Precision T7500 -Intel Xeon X5650 2.66GHz -6 cores, 12GB RAM, win7 64 Bit.